Adding the Bearing Spacer Upgrade Kit to M1 Rear Hubs dramatically improves bearing durability and eliminates hub play associated with a unthreading preload adjuster. 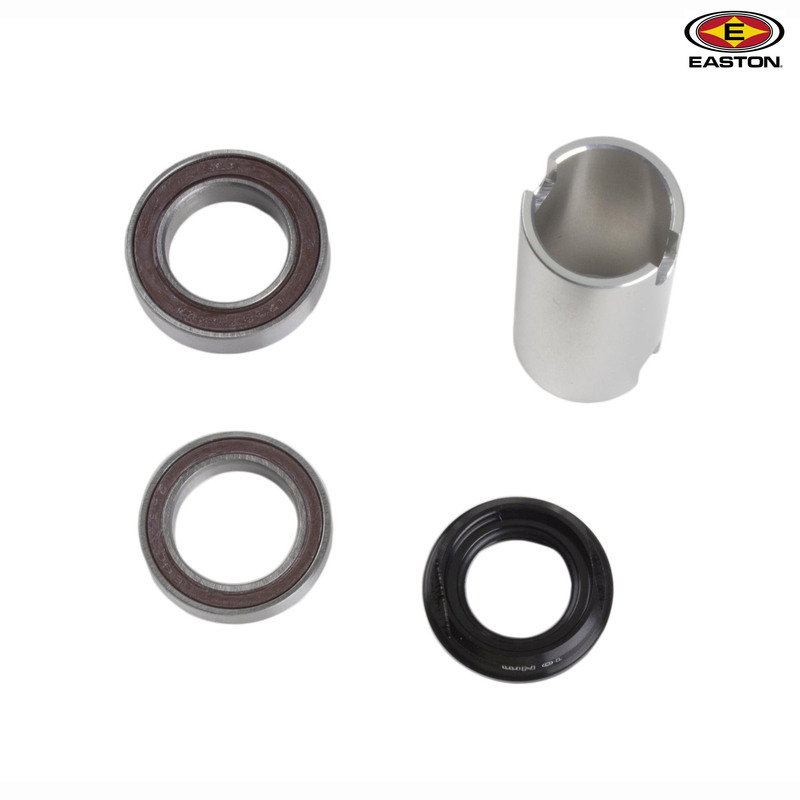 The Bearing Spacer Kit can be installed by retaillers or competent home mechanics. Please note: All parts of the upgrade kit need to be used together for the kit to work. ConsExpensive considering it was a poor initial design. ProsDesigned for purpose. Good quality bearing kit and separately purchased fitting kit. Does what it's designed to do. My hub was the faulty M1 - 121 unit. The upgrade includes a spacer sleeve not previously found in the hub along with new bearings. I believe not having this sleeve is what causes the failure in the bearings. Other manufacturers such as Hope having been using them years.. for exactly this reason. Follow the Easton YouTube video to fit this product. Do You Have Stock The Extra Parts? This kit only come with the bearings, pre-load adjuster and spacer. The tools required come in a separate "bearing drift" kit which is SJSC part number 35997. Are The Following Additional Components Included? The tutorial video by Easton of performing the upgrade also uses a half moon key woodruff key and the bearing installation tools. Are these also included in this kit as the image only shows the bearings and spacer. Thanks. I'm afraid these extra parts are not included, our picture shows everything that is included in the kit. Well, I am not sure whether I have the newer rear hub. It came on the bike, which is a Mondraker Dune XR 2013 model. Do you happen to know if the bike is fitted with the newer hubs? Many thanks in advance. Being a 2013 bike its more than likely it will be fitted with the newer M1 hubs, but to make double sure check your hub, the code should be printed on the hub shell itself. Easton Haven 12X135 Rear Hub Fitment? Hi, I have an Easton Haven 12x135mm rear hub and was wondering whether this (SJS Cycles Part Number: 35919) bearing upgrade kit will fit? I also want to know if you have the same upgrade kit for front 20mm Easton Haven hub. Thanks in advance. Providing you haven rear wheel is the newer M1-121 rear hub then yes this is the correct bearing upgrade kit. There isn't an upgrade kit for the front, the newer version of the hub the M1-112 uses two 6805 bearings.